A Peripherally Inserted Central Catheter or PICC line is a long, thin, flexible tube used for administering intravenous fluids and medication. It is inserted into a peripheral vein, usually in the upper arm and then advanced through increasingly larger veins until the catheter tip reaches a large vein in the chest above the heart. What is a PICC line insertion? PICC lines are usually inserted by interventional radiologists or specially trained health professionals and is a sterile procedure. A PICC line may have two or three channels, known as double or triple lumens. This allows different treatments to be given at the same time. 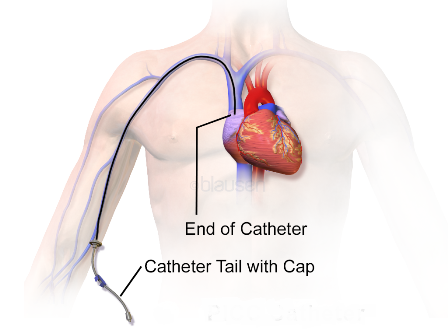 The catheter tail (end of the tube outside the body) has a special cap or bung that can be attached to a drip or syringe. Sometimes a clamp may be attached to keep the line closed when it is not in use. You can go home with a PICC line in place, and it can be left in for a number of weeks or even months. A PICC line is helpful if doctors and nurses find it difficult to get needles into you veins or if the walls of your veins have hardened from previous chemotherapy treatment. A PICC line is also helpful if you do not like needles. Total Parenteral Nutrition (TPN), where all nutritional needs of the body as supplied intravenously. This bypasses the digestive system by dripping a nutrient solution directly into a vein. How is a PICC line procedure performed? The procedure is conducted in an angiography suite (“cath lab”) at Intra in Epsom or North Harbour. Your specialist will be assisted by nurses and other highly trained staff. Ultrasound is used to locate the vein in the arm. You will be awake during the procedure but your arm will be numbed with local anaesthetic before the PICC line is introduced. You should not feel pain at the entry site but there may still be some non-painful sensations such as pressure. A small needle is inserted into the vein. Then a. fine wire is inserted through the hollow needle and the needle is removed. 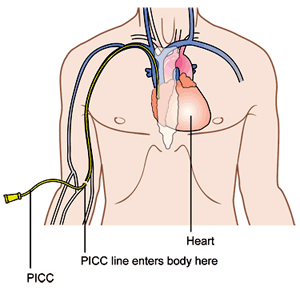 The PICC line or catheter is then threaded over the wire to guide it into a bigger vein near the heart. After inserting the PICC line and the procedure is complete, the catheter is secured with a dressing on your arm to ensure it remains in place and does not move. The sterile dressing also protects the site from infection. The PICC line can be used immediately following placement. This procedure generally takes between 20 and 40 minutes. Why do I need a PICC line? Fasting: You may eat until 2 hours before admission then you should not have anything to eat. You may continue to drink clear fluids. Check with your doctor but you should usually continue all your regular medications, (except those listed below).You can take them on the morning of the procedure with a sip of water. After the procedure you will be looked after for a short time by our qualified staff before you can leave Intra. Your PICC line will need special care after insertion. When the line is not being used, there is a slight risk it may become blocked. To stop this happening, a small amount of fluid is flushed into the line using a syringe. This is done regularly - usually once a week. As it is difficult to do this yourself with one hand, a nurse at the hospital will do it for you or arrange for a nurse to visit you at home. When you are at home it is safe to have a shower or a bath with your PICC line in place. Your nurse can provide you with waterproof dressings. Your doctor will discuss the specific risks and potential benefits of the procedure with you. How is the PICC line removed? In most cases, removing the PICC line is a simple procedure. 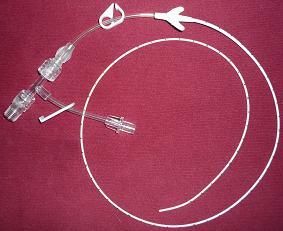 Generally the catheter line can be safely and quickly removed in a matter of minutes. After removal the insertion the site is normally bandaged with a sterile dressing and kept dry for a few days, during which the wound can close and begin healing.